As I previously posted, Gov. Deal stripped HB1 of the growing option, leaving it as immunity only. 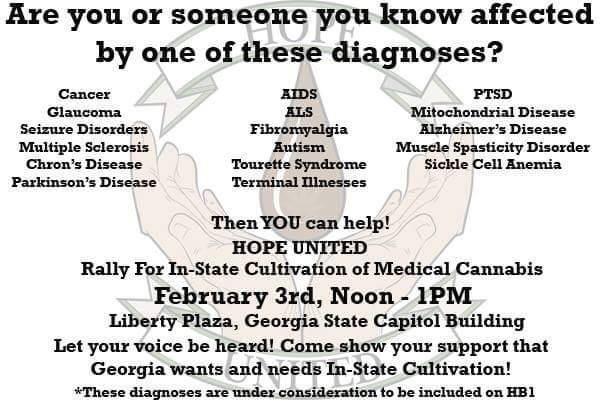 There will be a rally at the Capitol tomorrow to demonstrate the support for in-state growing. Please attend to show your support. There are currently 17 medical conditions included in the bill. However, the Georgia Sheriffs’ Association and District Attorneys’ Association do not support the expansion to other diagnoses beyond epilepsy. Please contact your local sheriff and DA. It’s that MRI time of year! Sunny ☀️ days are here. Maintaining the lead as my favorite sweatshirt.